Bharata Sanchar Nigam Limited, BSNL is the most popular Broadband Internet Service Provider in India. They are the largest wireline telephony service provider and command a market share of more than 75% in the wireline telephony service in India. Taking advantage of their vast wireline network, they provide a robust broadband service for accessing internet. In case, you are a BSNL broadband service subscriber, you might have felt the need to check BSNL Broadband Speed. Although there are some universal broadband speed testers available online (like speedtest.net), but you cannot be sure about the results they give, because there are lots of factors affecting the data speed you get. Apart from the speed offered by the broadband service, the speed reported by the speedtest.net might also depend upon the interface of BSNL gateway and the speedtest.net servers. The best way is to check the speed through the servers located within the BSNL broadband network itself. Check out the test given at the link given at the end of this post. 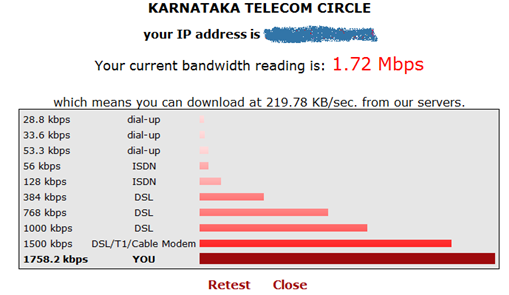 If you take the test given on that page, data is downloaded from a BSNL Karnataka server to your computer and vice versa. The BSNL Broadband speed test is done by monitoring the time taken in this data transfer. This might give a fair assessment of the actual speed you are getting with BSNL as the broadband service provider to you.